Kidspace Children's Museum is located at 480 N. Arroyo Blvd., in Brookside Park, Pasadena, CA on 3.5 acres of both indoor and outdoor, interactive environments. The museum features over 40 hands-on exhibits with daily programs and monthly events for children ages 1 to 10. The mission of Kidspace is to nurture the potential of all children through kid-driven experiences, inspiring them to become joyful, active learners. Admission is $14 for adults and children. Free for children under one year. For more information, visit kidspacemuseum.org. Don't just listen, experience the music! Create your own flair by designing a keepsake Arroyo Seco Weekend concert button. Don’t just listen, experience the music! In this hands-on activity, families will get to play and experiment with a variety of musical instruments. 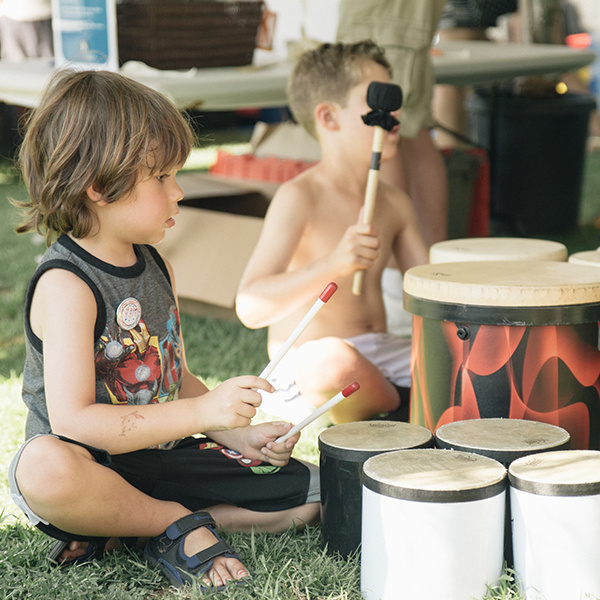 Jam with the drummers in our interactive drum circle led by Rhythm Child. Available every hour between 12:30pm to 6:30pm for 20-30 minute drum sessions. Early learners will enjoy this soft play space, inspired by the outdoor setting of the festival. Come create your own music, as families build a box guitar. Box guitars will have straps for ease of carrying.